Construction made of Mass Timber (also called Glued, Nail or Cross Laminated Timber) offers new possibilities of designing buildings with free and pure design. Architects can use it for walls, ceilings, floors and roofs. They offer several benefits including an eco-friendly alternative to concrete and steel. Is this the building material of the future? Cross Laminated Timber panels are mainly made of black spruce boards glued perpendicularly to 90 degrees and laminated with adhesives in several layers (3 to 7 layers). This bidirectional panel structure provides excellent stability. Glued Laminated Timber panels are composed of a stack of wood pieces, planed and pre-joined, and then press glued together with adhesives. Finally, Nail Laminated Timber panels are simply a stack of wood pieces nailed together. They are all factory-made, cut to the required dimensions and delivered on sites. Unlike the traditional use of wood as beams and columns, Mass Timber panels are innovative and can be used for walls, ceilings, floors and roofs and offer superior strength as they can replace steel or concrete. Growing particularly in Quebec (Canada) in large volume, black spruce is a renewable ecological resource. Mass Timber panels are therefore a long-term carbon sink and have less environmental impact than other building materials. Wood is more resistant to heat loss than other materials, 7 times more than concrete and 500 times more than steel. It takes less energy to heat and cool buildings made of mass timber. The latter also increases fire resistance and reduces the risk of spread. Several Mass Timber buildings have been built to date, all over the world. The majority of these buildings are only a few storeys. One of the major architectural challenges is to design higher Mass Timber buildings. Several safety and stability tests have to be carried out in this direction, including resistance to earthquakes. For the moment, buildings called "large hybrid systems" made of Mass Timber/concrete or Mass Timber/steel make a good impression and are very successful. Another challenge imposed by this type of construction is soundproofing. Wood is a lightweight (low mass) material with few acoustic properties, especially impact noise. Mass Timber alone, with its thickness, smooth surface and density, is also not a good material for absorbing noise. The interior aesthetics provided by the apparent wood (ceiling / floor) in this type of construction limits the acoustic solutions choices. It is necessary either to add mass by the floor, such as a concrete slab with acoustic membranes or to add suspended ceilings with soundproofing materials. Regardless of the solutions chosen, it is recommended that they have to be integrated at the beginning of the project when designing the building, otherwise one loses height and adds weight to the existing structure. Established in Europe since the beginning of the 1990s, North America has followed for about ten years now in the construction of this type of buildings. In Canada, Quebec is now second only to British Columbia in integrating Mass Timber into the construction of multi-storey buildings. Every construction worker: architects, builders, acousticians and manufacturers will have to work together to optimize and ensure the success of this noble and ecological alternative material in order to offer peace of mind. 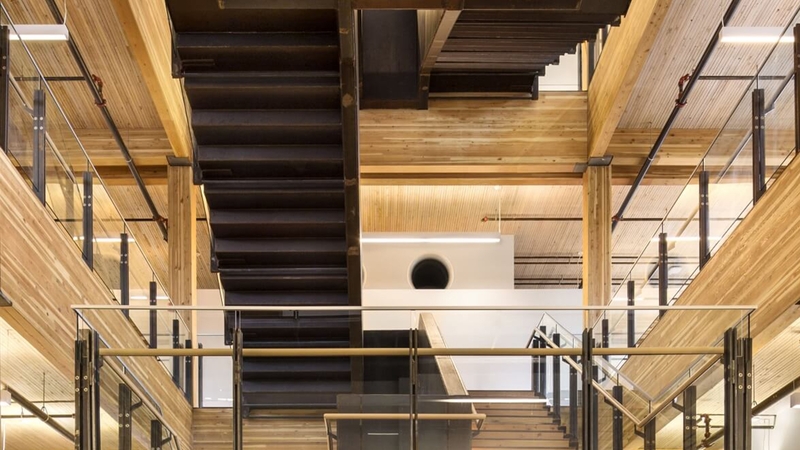 Photo : Nail Laminated Timber roof and Glued Laminated Timber beams at the MEC Head Office, Vancouver, B.C. , Ed White Photographics.